Shown at Photokina 1980 , this was Hanimex's attempt at the Ultra compact market. 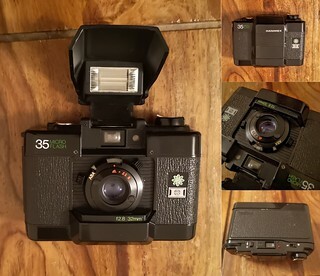 It has a built in SLR flash, but has no significant metering with a manual selected aperture in conventional use set by a series of pictograms. The 32mm 1:2.8 lens has 4 focus zones and the flash is manually triggered. Will work without the 2 xAAA used to power the flash and low light warning system. Described as having 1.180 & 1/60 shutter speed but suspect the latter in flash mode.